Rep. Heidi Sampson (R – Alfred) left, and Rep. Shelley Rudnicki (R – Fairfield) center, drew a line in the sand this week to defend funding for Career and Technical Education (CTE) Schools. AUGUSTA – Saying they disagree with Gov. Janet Mills’ proposal to cut funding to local vocational education programs in order to grow the Maine Department of Education’s bureaucracy, Republican lawmakers on Maine’s Education Committee drew a line in the sand this week. At issue was about $2.6 million in funding over the next two years that Governor Mills and Democrats think should go toward building “staff capacity” by hiring 36 new employees, 16 of which are non-teaching positions, in the Maine Department of Education. 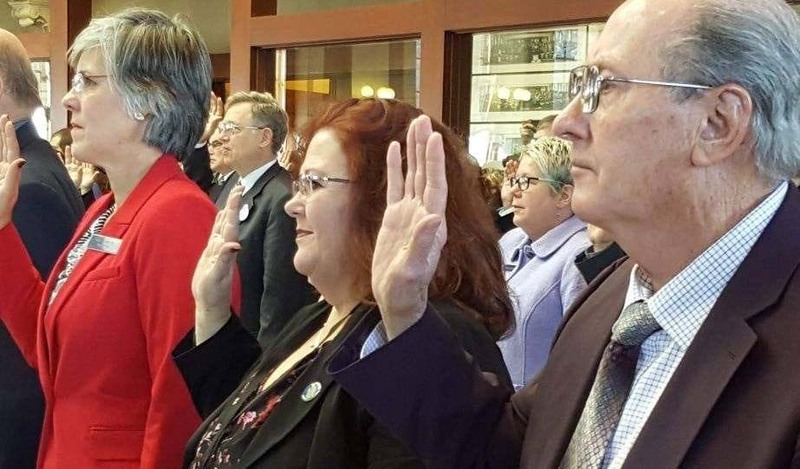 “We should invest in our students and classrooms to build a better future for all of Maine,” said Rep. Shelley Rudnicki, another Republican member of the committee who also serves as Chair of the MSAD #49 School Board. According to a press release from House Republicans, the vote split along party lines, with Republicans voting for $3.89 million in funding to Career and Technical Education schools, and Democrats voting for just $1.6 million in funding, while wanting to shift the balance of funding to the state’s Department of Education to increase staff in that department. The debate and vote came about as part of the Education Committee’s work on the proposed biennial budget put forward by Governor Janet Mills. Mills has sought to change several education related items in the budget, which she says will improve education over the long-term. The Education Committee’s report to the Appropriations Committee shows that Democrats sought to implement a “cap” on CTE funding with a 7-5 vote of the committee, while Republicans opposed the “cap” and supported the full funding amount. The Legislature’s Appropriations Committee will take up the proposal now, and review both of the positions put forward in the committee report.